Celebrities are the famous icons of today. They are known as the richest, high-class personnel. However, like any ordinary person they too die, and when they pass away, we should prepare a funeral event for them. 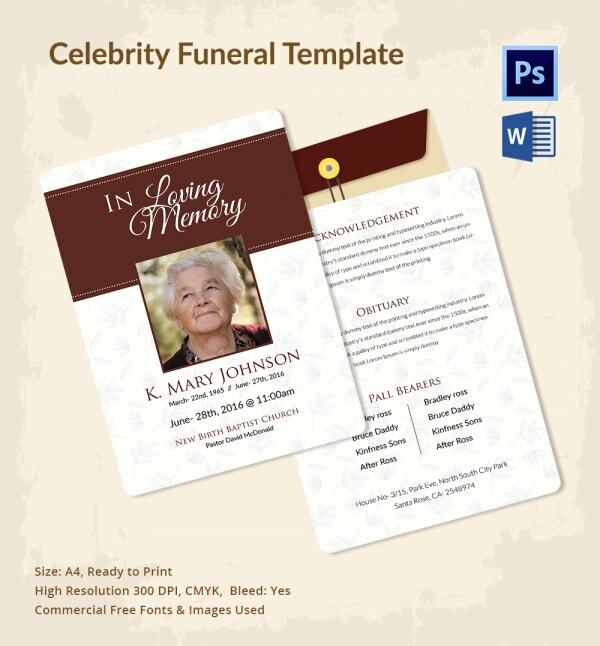 That is why you need funeral program templates for celebrities. They are specifically designed to help you prepare funeral programs, the order of funeral service, obituaries, and more. Even more, they are easy to customize. 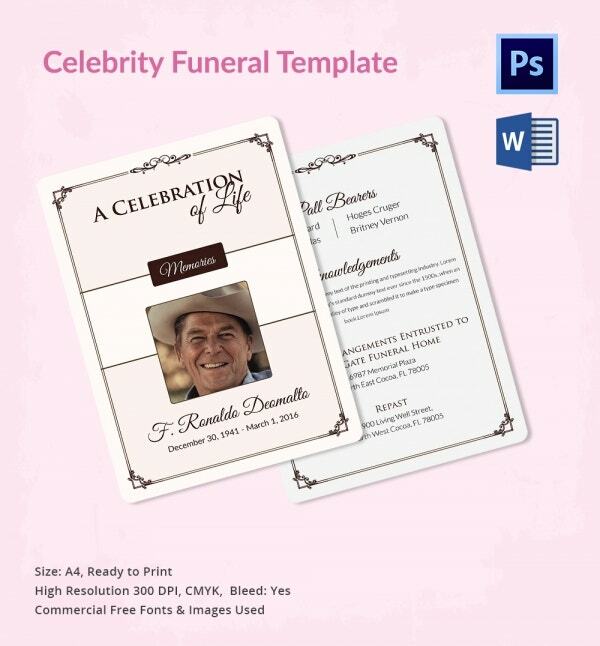 You can use this template to send a funeral invitation message to welcome living celebrities to the funeral event of the dead celebrity. The template also doubles as an obituary for celebrities. 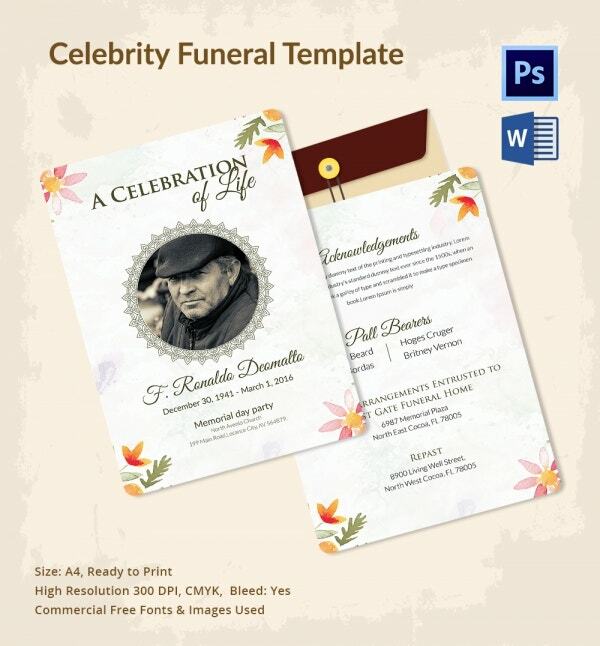 If you are planning a funeral, this template can help you to write a useful program for the event. The purpose of the program is to help you conduct the event from start to finish. 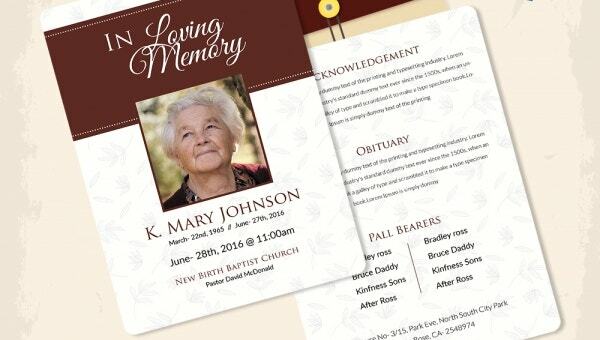 This template can help you send prayer requests and funeral invitations to friends and family members who you would like to be part of the funeral event. Just edit the image and text, then print and distribute it. The best thing about this template is that it is a complete design that does not require editing. You just need to download the template and then edit the content by replacing the text and images with yours. This template can help you to write a comprehensive obituary for the person that has just passed away. The model is easy to edit, features the CYMK color mode and easy to customize. > Who uses these Templates? The template is for people who want to announce the death of a celebrity. Of course, the death of a celebrity is almost always shocking, but it is necessary to report the event when it occurs anyway. The family of the celebrity can use these models to welcome friends, colleagues, and related family members to the funeral. 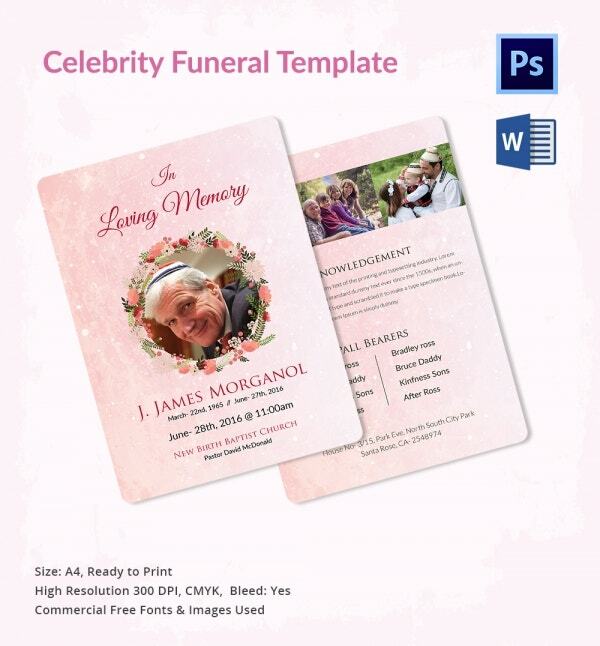 If the celebrity died at their workplace, the boss can use the premium template to write a death notice of the person in question. Moreover, the friends of the celebrity can help his/her family to spread the information about the death. 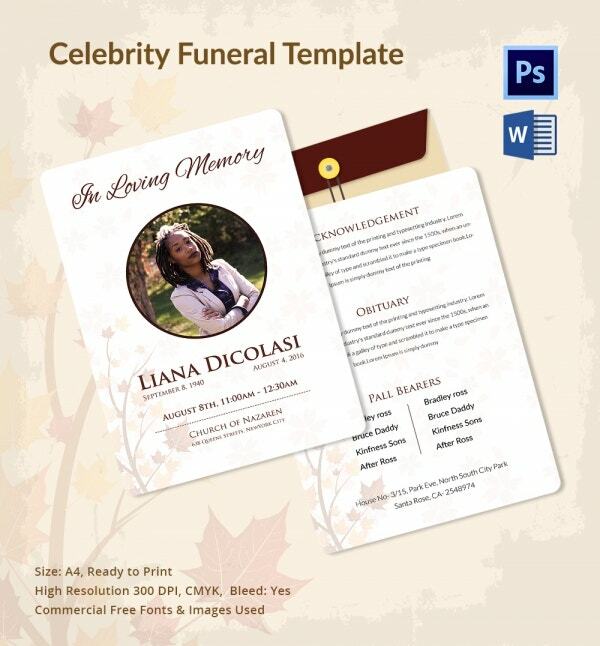 When you use this template to write a death case of a celebrity, many people will come to know that celebrity so and so is dead and gone forever. The death and funeral announcement eliminates the need for so many questions. By letting people know that a popular celebrity has passed away, people will stop asking why the icon never appears on TV or Magazines anymore. People will have the understanding that the celebrity will be laid to rest soon, whether they died young or stopped breathing at an old age. Overall, the template is easy to edit, which means it should not take you long to get content done.